At the end of 2016, Victor Pinchuk—one of Ukraine’s wealthiest oligarchs and sponsor of the recent YES 2018 conference—published an op-ed in The Wall Street Journal calling for “painful compromises” to establish peace with Russia. In particular, he urged Ukraine to table its NATO and EU hopes and put the Crimean issue on hold for decades. Pinchuk did not voice these ideas in vain; they have been adopted by Serhiy Taruta in his election campaign. Taruta, a Ukrainian oligarch from the Donbas, is trying to perform an uncanny yet common feint in Ukrainian politics. He is positioning himself as a "fresh face" in the upcoming 2019 parliamentary and presidential elections, even though he has been active in politics for twenty years. Taruta's career kicked off in 1998 when he was elected to the Donetsk Regional City Council. At the time, he was a seasoned businessman and the CEO of the Industrial Union of Donbas Corporation, which is one of the oldest and biggest corporations in Ukraine. In the 2000s he focused on business, and by 2008 Forbes magazine ranked him the 428th richest person in the world, worth more than $2.7 billion. Taruta has lost a lot over the years, especially since the annexation of Crimea and the war in Donbas, but he definitely hasn't "lost everything" as he likes to claim in interviews. Just take a look at his 2017 declaration. In addition, he is still the largest official donor of his political party (last year—1.28 million UAH, and this year—1.48 million UAH). This is the maximum possible financing from private persons by law. Taruta says his party is financed by "medium-sized and large business," the average donation is $50,000, and that the party spends everything it brings in. The party's financial reports reflect these claims. Taruta has never been a typical oligarch from the Donetsk region. He voiced support for Viktor Yushchenko in the 2004 Orange Revolution, and also supported Yulia Tymoshenko in 2010 presidential election. That's a key distinction between Taruta and other Donbas oligarchs: he has never openly supported pro-Russian political forces. Taruta has never been a typical oligarch from the Donetsk region. Thus, it seemed logical that Taruta was appointed as a Donetsk region governor in 2014 after the Euromaidan. A native of the region, a businessman with a good reputation, and someone who consistently supported the pro-Ukrainian movement, Taruta seemed to be the man for the job. However, his work as a governor did not last long. He started his new position in March 2014, but a month later pro-Russian militants stormed and captured Donetsk's regional administration building. At the time, Taruta seemed to downplay the growing pro-Russian activity in the Donbas, describing it as a "tiny minority—'about 300 people.'" When the war in Donbas started, Taruta criticized the actions of the Ukrainian government. 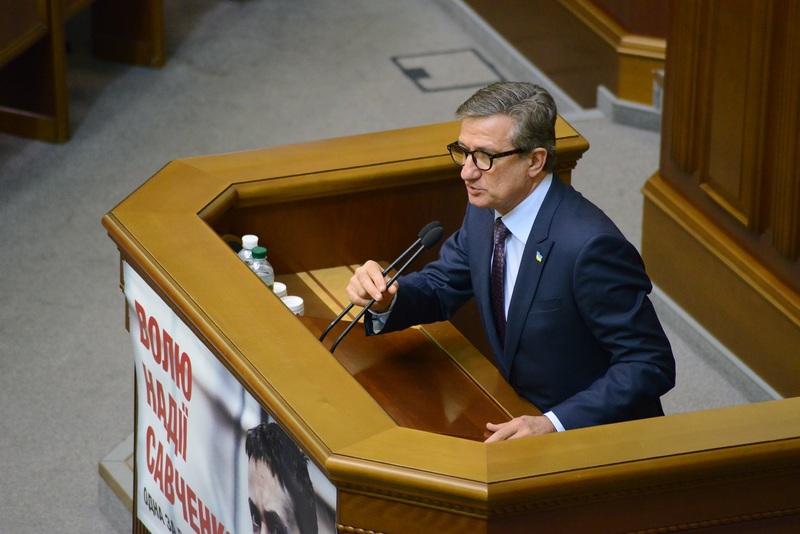 A month later, Taruta was fired, so he decided to move to the Verkhovna Rada instead. Taruta ran for election as an independent candidate, and won a single-member district in Mariupol taking 60 percent of the votes. Taruta is an influential person in the Verkhovna Rada; he is the head of the Subcommittee for the Protection of Historic and Cultural Heritage of the Committee for Culture and Spiritual Affairs, and he also leads the group for interparliamentary ties between Ukraine and Germany. In 2016, Taruta claimed on NewsOne TV channel that Yulia Tymoshenko invited him to join her party Fatherland as one of party's key figures. He also said that he has received similar offers from Petro Poroshenko's Bloc, Opposition Bloc, and "all others except for the Samopomich party." However, according to Taruta, he has declined these offers because he didn't want to tie himself to the history and legacy of these political groups. Thus, Taruta created his own political party Osnova (The Foundation) in the spring of 2017. The party program embraces many populist ideas widespread in Ukraine's politics today: among other measures, it promises the quick end of the war in the Donbas, the revival of the Ukrainian economy, affordable credits with low "European" rates, and a reduction of utility prices. It fails, however, to describe how to achieve these milestones. For instance, Osnova promises to drop the IMF loans and switch to foreign investments, as if attracting large-scale FDI is an easy thing for a country with an unreformed judiciary, a poor business climate, and stability risks. Taruta created his own political party Osnova (The Foundation) in the spring of 2017. The key word of Osnova's political program is compromise. "Constant conflicts hamper the development of the country. Ukrainians deserve fair, honest, and competent authorities. We all deserve to live in a successful Ukraine. For this purpose, it is worthwhile to achieve any reasonable compromises—between the East and West of Ukraine, between the center and the regions, between the common men and the authorities, between different political forces, between Ukraine and neighboring countries. Osnova will find these compromises," Taruta's program claims. This rhetoric, combined with an idea that Ukraine can cope economically by itself, makes Taruta often critical of the West. He regularly says that membership in the EU and NATO will be closed to Ukraine for decades, and that therefore the country should rely exclusively on itself. In an interview with TRC Ukraina, a TV channel owned by oligarch Rinat Akhmetov, he once saidthat the European Union "is telling [Ukraine] that we so far do not meet the norms [of the EU] and need some 15-20 years [to meet these norms]." Taruta often supports his messages by manipulations. For instance, in June 2018 he claimed that "according to sociological data, 52 percent of Ukrainians do not support Ukraine's NATO membership." VoxCheck, a fact-checking project by VoxUkraine, has shown that this statement was incorrect: June 2018 polling shows that only 33 percent oppose NATO membership, while 43 percent would support it, 7 percent would not participate in the referendum, and 18 percent are undecided. Taruta often supports his messages by manipulations. At the moment, voters don't seem to take Osnova very seriously. It has only has 1 percent support, but then again, the competition in the anti-western and populist camp is very high. Denys Kazanskiy, a Ukrainian journalist, points out that there are several parties already working to win over the same electorate: Opposition Bloc, Vadym Rabinovych's Za Zhyttia (For Life), as well as Vidrodzhennia (Revival), and Nash Krai (Our Country) which are made up of large numbers from the former Party of Regions. Thus, the chances of _Osnova_succeeding without forming an alliance with any of the more popular political parties are very low.